Clamp holders for Gifkins dovetail jig. Your must-have safety accessory! Add value to your box making experience! For safety and ease of operation, we recommend you purchase a pair of clamp holders and two Bessey clamps for your Gifkins woodworking jig. The clamp holders are designed to hold the Bessey Kliklamp on the jig, at a safe height above the rotating router bit. Each clamp holder fits under the knob on top of the sliding stop. 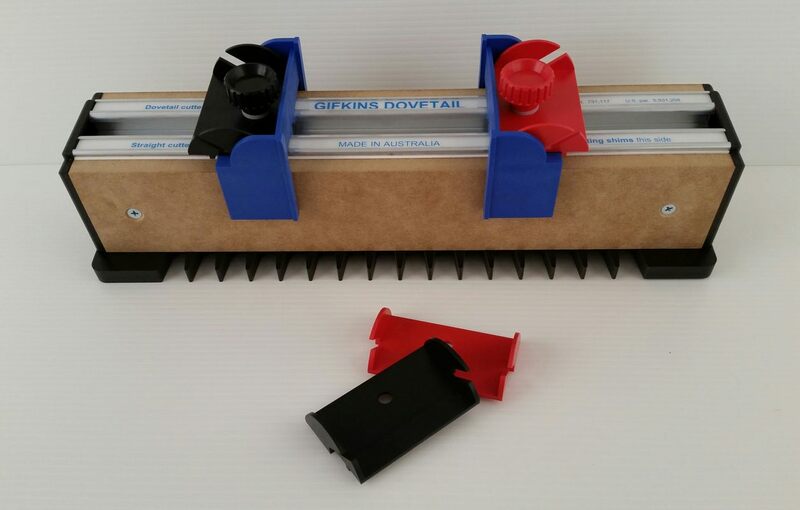 The Bessey Kliklamp is the only clamp we use and recommend for use with the Gifkins jig! It’s light-weight and secures any sized work on the jig. Pull back the lever to ratchet it closed. Click it open in a single action. Easy on! Easy off! This clever system will save your cutters and save your templates! The clamps and clamp holders are safety essentials for all schools, guilds, men’s sheds and home workshops!